"When I was sick and had to go to see you a lot, you never made me take all my clothes off, and you let my Mom stay with me, even though I'm ten years old. Thanks!" "Please don't talk about me when you come into my room! Talk to me. I'm seven, so I can understand. I hate it when you talk to everyone else but me." "It was nice of you to ask me how I'm handling things at school, and then to listen to my problems. I know some doctors only care about my lungs, not the real me!" "Yesterday you brought at least 100 people into my room when I was eating breakfast, and you examined my tummy, Remember? I did not like that one bit. Nobody told me their name, and I was very nervous. You should knock on the door, and ask me if it's OK with me! " "I felt terrible when I came into the hospital, and now I feel all better. How did you fix everything? Anyway, thank you. I hope that you'll fix other kids up, too!" "You whispered to my Mom when you came into my room, and all I heard was 'more tests'. How come you didn't tell it to me, too? I think that you should have." "When you told me about the tube that had to go down my throat, you told me that it wouldn't hurt. You lied...it did. I wish you would have told me the truth." "Do magic tricks for all the kids in the hospital. I figured that if you can make a dime come out of my ear, you can certainly get rid of my psoriasis!" "You told my mom to step out in the hall so that you could talk to her. Want to know how that made ME feel? Scared and goosebumpy. Don't you remember being a kid? Of course I figured I was going to die by the end of the day. And here I am, still. No reason to frighten me like that!" "I think that you shouldn't expect me to be brave all the time when things hurt. It's ok to cry sometimes and it made me feel worse when you were cross with me. And also you should let my Mum come into the room with me, even though I'm 14." "I just met you and I want you to know that the whole time we were together I felt really weird. You never even made eye contact with me. So here's a tip. Remember that we are not lab specimens. Please don't treat us like your latest science project!" "Before I was diagnosed with Cat Scratch Fever, my doctor said that I needed a biopsy so he could determine whether the lymph node was cancerous or not. I was told that the biopsy would only hurt a little each time a sample was taken (they had to take three samples). The minute the first sample was taken I felt like I had been stabbed. I wish he had told me-not my mom the truth about how much the test was going to hurt." "Please, please,please listen to my mother when she brings me into the ER. I am 12yrs old and have been trached and G-tubed since I was 5 weeks old. She knows me and my medical condition very, very well. Most recently I had yet another GI bleed. When I was seen in the ER by a second year resident, she discharged me with a diagnosis of viral infection. I was in a lot of pain until my mom finally talked to the regular doctor and I was started on the correct meds. She knows she doesn't know everything but she's knows me well. Thanks!" "When you say, 'I'm going to look' why do you start touching? Looking is with the eyes, not the hands." "It really is no fun being so sick. Some doctors only care about my illnesses, not the real me. Thanks for the hug and kiss you gave me. It really made me feel better, even when the pain in my head was so bad. I can tell you really care about me." "Just tell us the truth and don’t try to hide things from us. We always know when something is wrong, even if we don't know exactly what is going on. Sometimes we get very scared if you hide things from us 'cause we think we are going to die or something...so please fill us in. Remember it’s our lives you are dealing with." "Well, I've got to tell you that a lot of times I like my med students better than my docs...I guess because they haven't been around long enough to get all full of themselves and mean and stuff. I do have I have two favorites, though, who always hang out with me and cheer me up when I'm sick. Now THEY are cool." "Remember this one! I just had surgery to correct the way my feet walk on the ground, and the doctors all came in and started fooling around with my legs. It hurt so much that I cried for a long time. If you HAVE to do that to one of your patients, please, please, please give them some pain medicine FIRST!" "So many of you docs don't treat kids as equals, like "I'm just a kid, why should I need to know what's really going on in my body?" or "I won't understand half of what you tell me, so why bother, right?" WRONG! 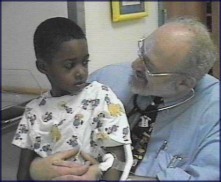 I hope that you'll be more sensitive with your patients, no matter HOW old they are!" "When I say that I am having trouble breathing, please, please, please don't make me sit in the waiting room for hours before you check me out. When I finally see you, I'm expected to tell you my entire medical history, and by then I can't even talk!" "Sometimes you think that kids don't need to know everything; that if they don't know what to expect, they will be more relaxed. Please understand that the total opposite is true. I would rather know that something is going to hurt, make me sick, or be unpleasant than to have you just spring it on me. Knowing what to expect helps me to cope better with the treatment. Really!" "Please tell us EXACTLY what will happen. Or just tell us what could happen if you don't know. It's better than wondering and assuming the worst. Actually, I'd rather KNOW the worst." "When I told you I was sorry for asking you such stupid questions, you were the best. You told me that it's my body, and that if I'm worried about something, then there's something to worry about. You also told me that none of my questions were at all stupid, and that you were going to check out my concerns. Thanks a lot. Every doctor should learn from you!" "As a teenager with a long history of treatment for a rare disorder, I wish that you had spoken to me as though I were intelligent, rather than talking "down" to me. After all, by now I ought to know something about this disorder since I've had it all my life. Let me give you an example--when I was 14, I had appendicitis, and the doctor actually came to my bedside and asked me, as though he were speaking to a toddler, "Does'em tummy hurt?" --see what I mean?" “I heard you call me the cardiac patient this morning, and I hated that. My name is Justin, and it seems like the I that’s me disappears when you talk about me like that." "Please remember that surgery is never as easy for us as it is for you. Example- you were in the OR for an hour and then got to go home and enjoy the weekend. I had a long recovery ahead of me. It took my 4 weeks to figure out how to dress with just one hand. So, unless you have had the same procedures done please don't tell anyone that it will be 'a piece of cake'." "Make eye contact with your patients. They will trust you more if you look at them when you are speaking." " Please don't lie to us. It doesn't make us feel good. For example, one time I had to go to the hospital to get a test done. When I was waiting I saw a cart outside of my room with needles on it. A doctor came over and said, "Don't worry, this isn't for you." Then about a minute latter that same doctor came into my room with the cart. Then he told me that the test wouldn't hurt at all, but when he poked me it hurt SO bad. Just tell the truth, even if it is not the most pleasant!" "If there is a non-traditional family arrangement, please try to include all the adults when giving information. Make more than one call or set a meeting to discuss a diagnosis with everyone. This would have really helped me! My grandparents are my guardians but my parents are both very involved in my life. My doctors keep only giving information to my grandparents, but they can't answer all my parents' questions! Thank you." "I wish that you and the nurses would talk to each other. And that when you need to take blood, you would think about how it must feel to kids, because let me tell you, it is not easy." "When I was about to be put to sleep, that pat on the arm really calmed my nerves." I'll carry you over to the site map. Do you have some other tips for doctors? If you do, I hope that you'll mail them to me in this envelope.